Emeritus Archbishop Barry Hickey, Bishop Michael Morrissey and Emeritus Bishop Justin Bianchini. The Most Reverend Michael Morrissey was ordained the ninth Bishop of Geraldton on the eve of the feast of Saints Peter and Paul, Wednesday 28 June at Nagle Catholic College Gymnasium, Geraldton. The Archbishop of Perth, the Most Reverend Timothy Costelloe SDB, was the Principal Ordaining Bishop. 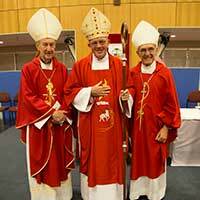 The Principal co-consecrating Bishops were Emeritus Archbishop of Perth and the seventh Bishop of Geraldton, the Most Reverend Barry Hickey and the Most Reverend, Justin Bianchini, Bishop Emeritus of Geraldton. The Apostolic Nuncio in Australia, His Excellency the Most Reverend Adolfo Tito Yllana read the Papal Bull in Latin followed by a translation in English. This entry was posted in Bishops, Press Releases and tagged Diocese of Geraldton, Episcopal Ordination on June 29, 2017 by ACBC Communications. 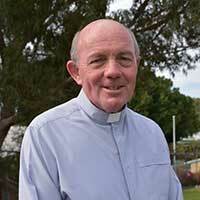 The Holy Father has today appointed Fr Michael Morrissey, the Vicar General and Chancellor of the Diocese of Geraldton, as the ninth Bishop of Geraldton. Bishop-Elect Morrissey is the first Bishop of Geraldton who was born, raised, ordained and has ministered in the Diocese. Archbishop Denis Hart, President of the Australian Catholic Bishops Conference welcomed the appointment, ‘On behalf of the Australian bishops, I join priests and people in welcoming Fr Michael Morrissey as Bishop of Geraldton. He has long priestly experience of Geraldton and already has been involved with so many people young and old. This entry was posted in Bishops, Diocesan News, Pope Francis, Press Releases, Vatican News and tagged Diocese of Geraldton, New Bishop, Parishes, Pope Francis, Western Australia on May 15, 2017 by ACBC Communications.